Mohtarma Asiea Naqash, Hon’ble Minister of State for Health & Medical Education, Housing & Urban Development, Social welfare, Power Development and Industries & Commerce J&K on 13 April 2018 presided over the award function of Swachhata Pakhwada with theme of Swachhata Se Sidhi in the auditorium of the Govt. Lal Ded Hospital, Srinagar the that is being held across the Health Institutions of the State w.e.f. 1st to 15th April 2018. 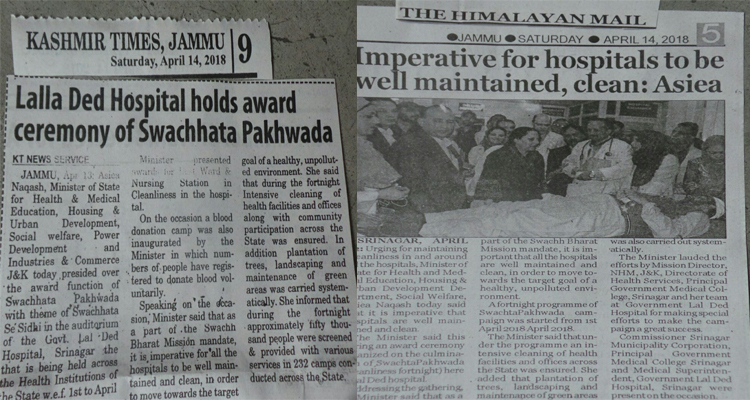 Hon’ble Minister presented awards for Best Ward & Nursing Station in Cleanliness in the hospital. On the occasion a blood donation camp was also inaugurated by the Hon’ble Minister in which numbers of people have registered to donate blood voluntarily. Speaking on the occasion, Hon’ble Minister said that as a part of the Swachh Bharat Mission mandate, it is imperative for all the hospitals to be well maintained and clean, in order to move towards the target goal of a healthy, unpolluted environment. She said that during the fortnight Intensive cleaning of health facilities and offices along with community participation across the State was ensured. In addition plantation of trees, landscaping and maintenance of green areas was carried systematically. She informed that during the fortnight approximately fifty thousand people were screened & provided with various services in 232 camps conducted across the State. Hon’ble Minister congratulated Dr Yashpal Sharma, Mission Director, NHM, J&K; Directorate of Health Services; Dr Samia Rashid,Principal Govt. Medical College, Srinagar and her team at Govt. Lalla Ded Hospital Srinagar for making special efforts during the campaign in cleaning of health institutions, carrying awareness activities on hygiene and plantation drive in the facilities so as to make the facilities cleaner and healthier. 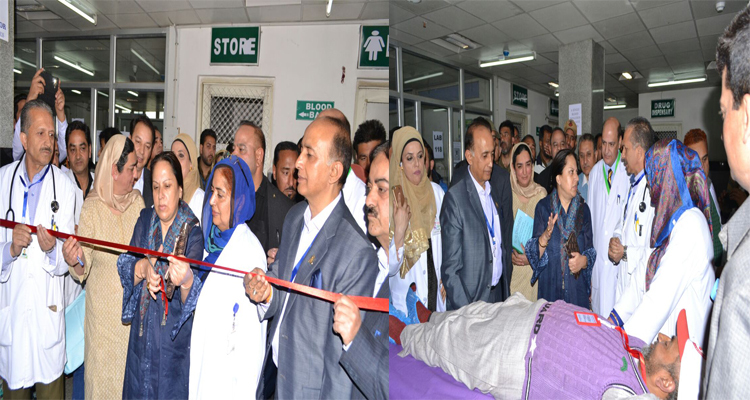 While acknowledging the difficulty in maintaining cleanliness in Lalla Ded hospital, Srinagar because of huge rush of patients and attendants Hon’ble Minister desired to maintain proper patient care along with proper sanitation and hygiene in the institution. Hon’ble Minister directed Mission Director, NHM, J&K and Commissioner Municipal Corporation, Srinagar to extend the support of their organisations to associated Hospitals of Govt. Medical College, Srinagar in this regard. Dr Yashpal Sharma, Mission Director, NHM, J&K while speaking on the occasion assured Hon’ble Minister that National Health Mission will always support Govt. Lalla Ded Hospital Srinagar so that the benefits of schemes under NHM reach the common masses. He said that National Health Mission shall support Lalla Ded Hospital Srinagar in LaQshya programme that is intended for achieving improvements in the intrapartum and immediate postpartum care, which take place in the labour room and maternity operation theatre by addressing structural issues like infrastructure, Human resource, equipments, drugs, consumables and other issues that affect processes of care. Others who spoke on the occasion included Mr. Reyaz Ahmad Wani; Commissioner Srinagar Municipality Corporation; Dr Samia Rashid, Principal Govt. 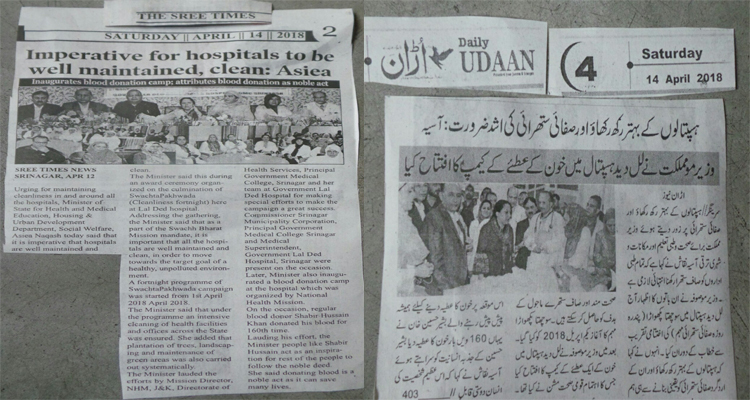 Medical College Srinagar & Dr Shabir Siddiqui, Medical Superintendent, Govt. Lalla Ded Hospital, Srinagar. 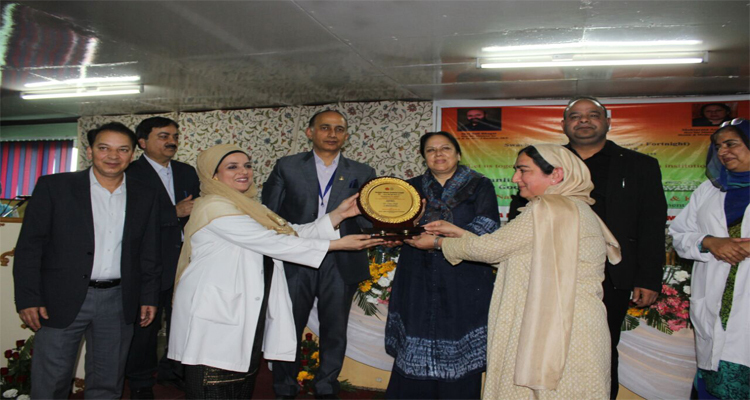 The function was attended by Professor Dr Shehnaz Taing, Head of Department, Gynae & Obstetrics; Dr Talat Jabeen, Chief Medical Officer, Srinagar; Dr Shabir Siddiqui, Medical Superintendent, Govt. Lalla Ded Hospital, Srinagar, Dr Talat Jabeen, Chief Medical Officer, Srinagar; Dr Mohammad Shafi Koka, State Nodal Officer, NHM, J&K; Dr Mushtaq Ahmad Dar, Divisional Nodal Officer, NHM, Kashmir, Senior Officers from Directorate of Health Services, Kashmir; Dr Farah, Dy Medical Superintendent, Govt. Lalla Ded Hospital, Faculty from Govt. Medical College Srinagar and other officers from State Health Society, National Health Mission, J&K.